More than two months after the district administration had announced that the city would soon see mini buses moving on the roads, the ambitious plan is yet to take off. Tension prevailed in Chowni Mohalla today over a group clash between two rival groups that took place in the Civil Hospital late last night. Heavy police security was deployed in the area besides at the civil hospital to avoid any further violence. Members of two different groups were admitted in the hospital. The accused Satish Naggar being taken away by a team of the district police; (right) the damaged car, allegedly belonging to Satish Naggar, one of the accused in Saturday’s violence at the Civil Hospital. — Tribune photographs. A number of Non Resident Indians, have started looking back to their roots with care and concern. Like Mr Kuldeep Singh Grewal, a Canada-based NRI, who contributed Rs 2 lakh for the repair of the local dispensary. 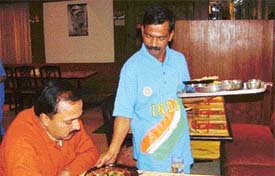 ‘‘We felt extremely proud when at the onset of the World Cup cricket matches, we were asked by the hotel management to don the blue -coloured uniforms that our Indian team is wearing,’’ said Mahesh and Suresh, who work as waiters in Sagar Ratna. A father shot his son at Punjabi Bagh Colony in Basti Jodhewal following an altercation over money late this evening. According to sources, 60-year-old Gurcharan Singh shot his son, Avtar Singh (25) with a .12 double barrel gun when the latter asked him for Rs 70, 000 to go to Nepal with his friends. 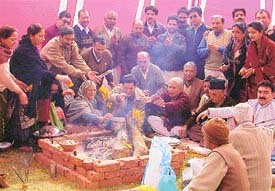 J&K Minister for Industries, Mr Ramman Mattoo, today assured the displaced Kashmiri Pandits that the new government in the state was keen on their rehabilitation. The Jammu and Kashmir government has started wooing the industrialists in Punjab to set up their units in that state by offering massive incentives in terms of subsidies and exemptions on various taxes, besides providing power on concessional rates. In an effort to lay more emphasis on self appraisal, the local office of the Punjab State Electricity Board organised a technical interaction camp at Pohir Road on Saturday. The camp was presided over by Mr Mukhmohan Singh, Superintending Engineer, Suburban Division Ludhiana. Officers and employees from Jagraon, Raikot, Lalton, grid maintenance and Ahmedgarh Divisions participated in the camp. The Central Zone of the PSEB has started a special camp to regularise illegal connections for consumers in the areas of Haibowal Khurd, besides X, Y and Z blocks of Rishi Nagar serviced by the Haibowal centre. The IMA Ludhiana has decided to form IMA Club Ludhiana in the existing lawns and building of IMA House, BRS Nagar. A meeting to this effect was held in the IMA Building under the chairmanship of Dr Gursharan Singh. Members of IMAs of the surrounding areas including Phillaur, Samrala, Khanna, Mullanpur and Sahnewal also participated in the meeting. A 10-year-old girl of Chhapar village has accused her mother and maternal grandmother of conspiring to get her paternal grandfather’s brother killed more than three years ago. Local leaders of the village claim that had the police acted promptly and given due weightage to girl’s statement, culprits would have been behind the bars till now. The Focal Point police has recovered badly decomposed bodies of two unidentified youths from the under-construction LIG flats near Baba Jaswant Singh Dental College here today early morning. Keeping in view the need of a government school for children of PAU employees, the present Government Senior Secondary Model School came into existence in the year 1972 in three quarters 9/3, 9/36, 9/37 on the PAU campus Itwas named Government Model Middle School and the medium of instruction selected was English. 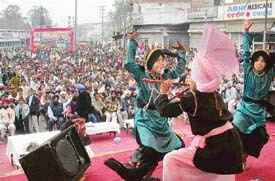 The school started with 50 students and 6 teachers and was attached to Government High School, Cemetery Road, Ludhiana. Students of Govt. Sr Sec. 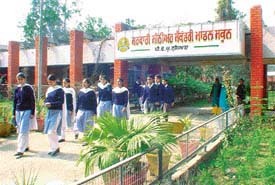 Model School, PAU Ludhiana. Ms Gurdeep Kaur took over the reins of Government Senior Secondary Model School, PAU, on October 9, 2000. Earlier she had served as Deputy District Education Officer in Ludhiana. As many as 1.25 lakh jobs will be available in information technology sector for industry in India said Mr S.P. Arya, Vice-President (Systems), Hero Cycles Ltd, Ludhiana, in a seminar organised by Desh Bhagat Institute of Management and Computer Sciences here on Sunday. 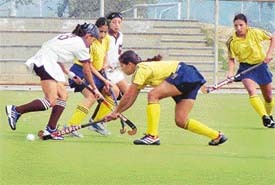 Northern Railway, Delhi, outclassed Western Railway, Mumbai, 2-0 to retain the title in the VIIth All-India Mohinder Partap Singh Grewal Women’s Hockey Tournament that concluded at the astro turf ground of Punjab Agricultural University here today. Kulwinder Kaur, who came out triumphant in the 100 m race, finished-runner up in long jump and also figured in the 4x100 relay race squad, that got third position, was adjudged best athlete in the annual athletics meet of the Guru Nanak Khalsa College for Women, Gujarkhan Campus, Model town, here today.